I receive many emails from people who want to pursue career in photography. I would like to answer some frequently asked questions here. Can I second-shoot or tag along? Out of respect for my couples and their big day, I will only bring experienced professionals. I am responsible for not only my actions, but those of people I bring with me. And yet, everybody has to start somewhere. I’ve been there. Shoot as much as you can. Get words out to family and friends. Look up and post on craigslist. Make your bids on snapknot. Learn as much as you can. Search google. Watch tutorials on youtube. Take a CreativeLive course. Talk to other photographers. Once you have something to show, you can use that to get your foot in the door. One way to get a jump start is to sign up with high volume nationwide studios (generally geared toward lower budget clients). You will gain experience quickly. In most parts of this country, you will not be able to make a living from this alone however. Wedding photography is a specialty. After just couple weddings, you will know whether working as a wedding photographer is the right fit for you. Then, you can go deeper and find out what kind of weddings and what kind of couples you enjoy working with. Photography is a popular hobby many people feel passionate about. Camera is cheap. There is a plethora of lightroom presets. Because barrier of entry is relatively low, there will be a lot of competition. Yet, those able to offer something others can’t will be able to differentiate themselves and sail along. How? That is for you to find out. In the land of wedding photography, it generally comes down to Canon or Nikon. Fuji has been pushing out some fine products, but I don’t feel ready to jump on quite yet. Looking forward to seeing what they do with XT-3 or equivalent camera. Moving on. I have used both Canon and Nikon gears and found both systems to be excellent. I prefer Canon’s color and quiet(er) shutter is a big bonus for me since I work with low-key photojournalistic approach. Also, I feel that Canon’s 50mm & 135mm put out nicer images than Nikon equivalent. You don’t need the newest and most expensive equipment to start. You are the most important part of the equation. However, you are still responsible for documenting one of the most important day of two people’s lives. Prepare accordingly and give your best. You will most likely want to go with a full frame camera for weddings unless you will be shooting out in broad daylight only. Used Canon 5D II, 6D, and Nikon D600/D610, D700 can be picked up for not too much money. A backup camera is highly recommended for weddings. Lenses are personal choices. My choice may not be the right choice for you. It largely depends on your aesthetic preference and your shooting style. I’ve tried third party lenses, but found Canon’s best lenses to be overall superior although they cost more. Sigma Art series also have amazing optics. However, I found autofocus to be inconsistent compared to Canon even after using Sigma’s calibration dock. At weddings, Canon 35mm 1.4 II & Canon 85mm 1.2 II are my most used lenses(80+%). They are pretty heavy, especially the 85mm. I also use Canon 50mm 1.2, Canon 100mm 2.8 IS Macro, and Canon 135mm 2.0. I also have several smaller versions for some of these as backup & traveling. 35mm: My must have focal length. It includes enough context for storytelling, but still has the ability to blur out the background if you move in close. I have Canon 35mm 1.4 (original), Canon 35mm 1.4 II, Canon 35mm 2.0 IS, Sigma 35mm 1.4 Art. At the moment, 35MM 1.4 II is my favorite. It is the sharpest and retains good contrast even in backlit situations (ex. outdoor ceremony). 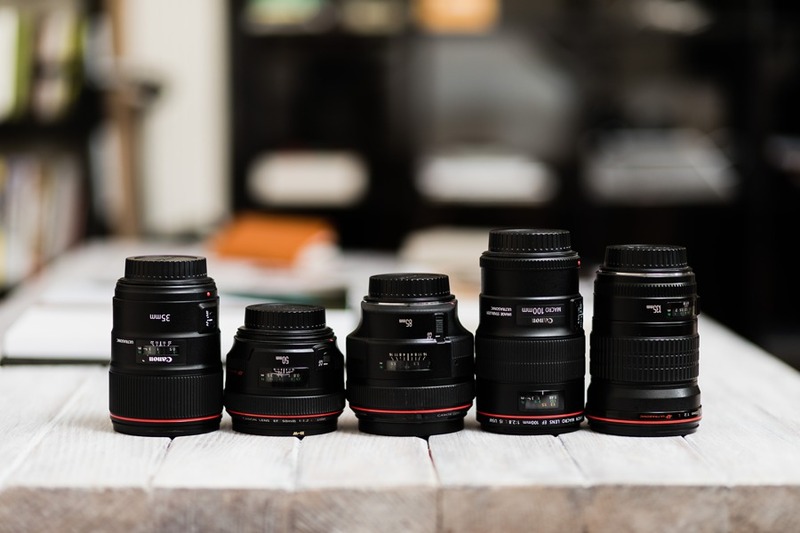 50mm: I own or have used Canon 50mm 1.2, Canon 50mm 1.4, Canon 50mm 1.8 II, Canon 50mm 1.8 STM. The 1.2 has character that other 50mm lenses lack. Using this lens when my couples are backlit by sun = magical. 85mm: My second most used focal length. I have Canon 85mm 1.2 II & Canon 85mm 1.8. The 1.8 is great – sharp, fast, light. The 1.2 II is special. It is slow. Weighs a ton. Kind of difficult to use. For me, amazing rendering makes up for it. AF is slow, but I find it to be more accurate than the 1.8. 100mm: I have 100mm 2.8 IS Macro and older 100mm 2.8 Macro(non-USM). Both are super sharp. The “IS” is helpful in some situations, but not a must. 135mm: Great focal length for capturing candid moments from distance. 85mm is great, but 135mm is more discreet. Canon 135mm 2.0 is a really nice lens. It creates somewhat similar look to that of 85mm 1.2 II. You could shoot an entire wedding with just 24-70mm 2.8 or with 70-200mm 2.8 if you want. They are also fine lenses in the right hands, especially the 2nd versions. However, I believe using fixed focal length is beneficial in developing the creative eye. B.Y.O.L. You can get by just fine with couple cheap manual flashes if you learn to use them correctly. If you want TTL, go for Canon/Nikon or high quality third party units. 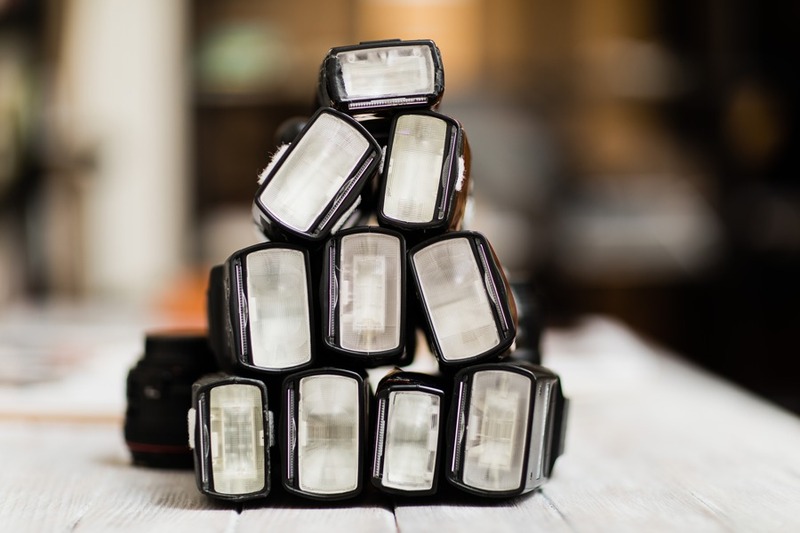 Many cheaper TTL flashes tend to be inconsistent in output. Once you are getting good consistent results with on-camera flash uses, you can branch out to off-camera-flash(OCF). Then, you can start experimenting with light modifiers such as umbrellas, softboxes, and magmods. You can also shoot without flash if your camera has good low light capabilities and that fits your style. Do you have any questions? Send me a message, I am happy to help.